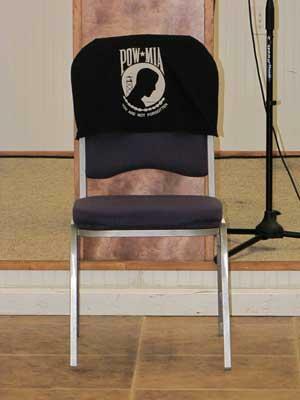 An empty chair with the POW/MIA logo on it is always present at an American Legion meeting. Officers of the newly-formed Hilton Stone Post 279 of the American Legion were given the oath of office Thursday, May 20. Those sworn in were Britt Knox, Commander, Dan Bowling, Finance Officer, Carol Johansen, Third Vice Commander, Penny Daniels, Adjutant, Ron Lewis, second Vice Commander. Also sworn in were two of the Executive Board, they are Jim Stone and Bob Stoetzel, the third member of the E- Board Charlie Harrell was not present. Along with the administration of the Oath of Office some officers were given other duties. Jim Stone is the Chaplain for the Post and Bob Stoetzel is the Post Historian. A guest speaker was present to talk to the Post and the wives about creating an auxiliary unit. Linda Winkles, from Manchester Post 78, talked to the ladies that were present and explained to them what an auxiliary did. One of the main duties of the women’s auxiliary is to volunteer at the VA hospitals. To do whatever they can to help the VA patients, this could be sending cards for them or running errands as well as aiding the families. The concept of the American Legion is to help the veterans; the Legion supports 100% Americanism and brings to the minds of everyone that will hear the plight of today’s veterans. The Legion takes no political sides and does not back any candidate. We promote the memories of those wars of the past so people will never forget the sacrifice that our fighting men and women gave. There are presently over 3 million members of the Legion. Please help us help those who served. Over the Good Ole Days and the swearing in ceremony four new members were signed up.